"Are Corporations Ruining Live Music in the Bay Area?" I can't get a ticket for anything even remotely popular for under $100 already. Far as I'm concerned, it's long been ruined. This piece raises many valid and important points, but it falls short of offering any kind of solutions, leaving the reader to assume that the author believes that fighting to preserve the status quo (particularly as it pertains to organized labor) actually offers a viable way forward, which it doesn't. There are dozens of local government entities in our area, including local agencies, cities, and counties, and the public's knowledge of their activities is dependent on robust reporting. Losing this capability seriously erodes our democracies. Support your local papers/websites by subscription. Patronize their advertisers. There's no quick fix. But local ownership/employee ownership might be one way out of the box. This kind of corporate-profit mentality has wrecked newspapers all over the U.S. But this particular outfit seems hell-bent to eventually ruin all quality journalism within its reach. We have seen our own local DFM [Digital First Media] newspaper, the Marin Independent Journal, lose valuable staff and excellent reporters because of Alden's greed. I fear for our county — and all counties — will be left in the dark once fully consumed by this monster. How can we stop this? I, for one, would like to try. 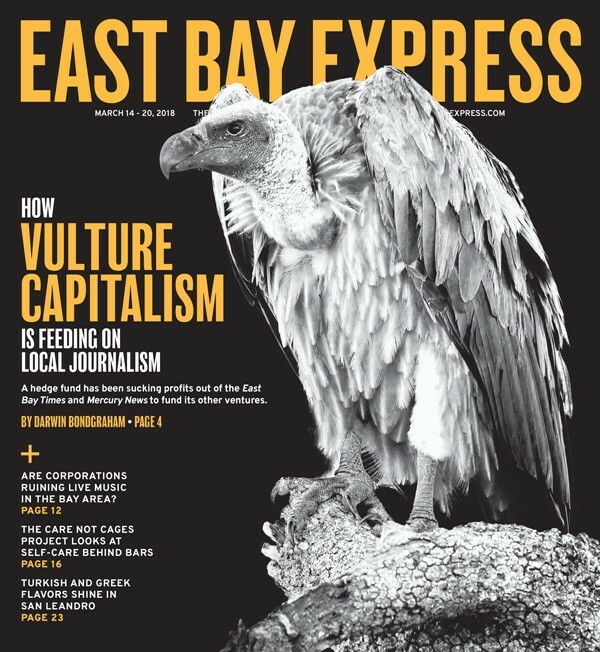 I'm thinking of friends fighting to inform the public and feed their families in the Bay Area. I'm not a financial genius, but I'll bet Google and Facebook could buy up every struggling "content source" in America and suffer nothing worse than a one-day stock blip. With legalization, as was feared, comes excessive regulation and increased taxation of cannabis. This will push folks in need of high doses of medical cannabis to the black market, which will flourish by word of mouth. Also, many who can benefit from doses of CBDs for pain (who do not wish to feel "high") are being priced out because they cannot afford the inflated pricing since Jan. 1. CBDs were never inexpensive, and as medicine, we need to lobby to have them covered under insurance to avoid addictive substances for pain control. I'm a bit conflicted about this. Regulation is here and has its place. This is just one extreme example of someone claiming this is their only salvation. 1000 mg THC edibles probably should be illegal (or highly regulated) on one hand. That could be dangerous for adults and what if a kid gets a hold of it? Besides the massive dose, who wants the sugar and other crap? There are oils, tinctures, concentrates, and so many options that this seems like a non-issue. You can also grow your own plants too, right? This is not so different than alcohol or OTC and Rx medications. You wouldn't want super potent booze or cold meds that could cause harm and certainly not packaged into an edible candy form to be easily available would you?